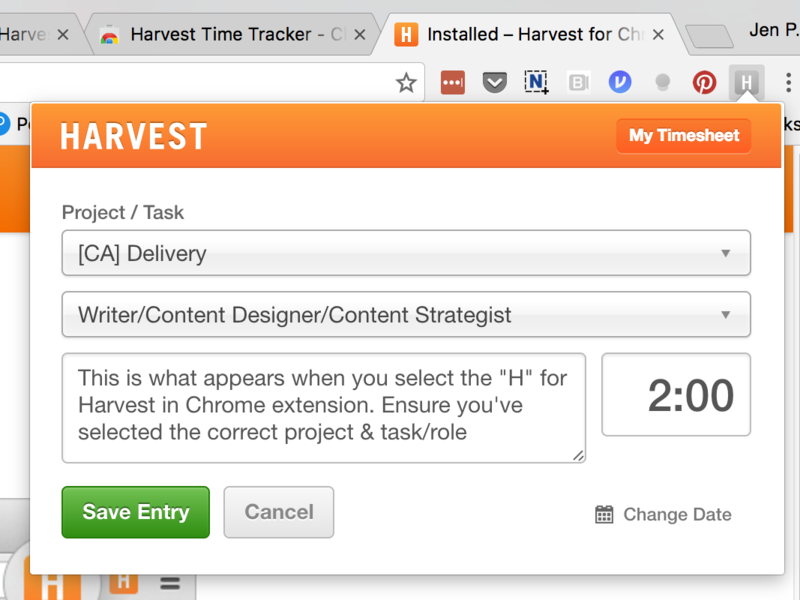 Harvest is an easy-to-use web app that allows us to track and allocate time and expenses for different projects. As an employee, you're responsible for reporting your own time and expenses. Time should be tracked daily and in appropriate categories. Optional approaches include Jira and Trello integrations and a mobile app. Time billed to the client is in 15 min increments. 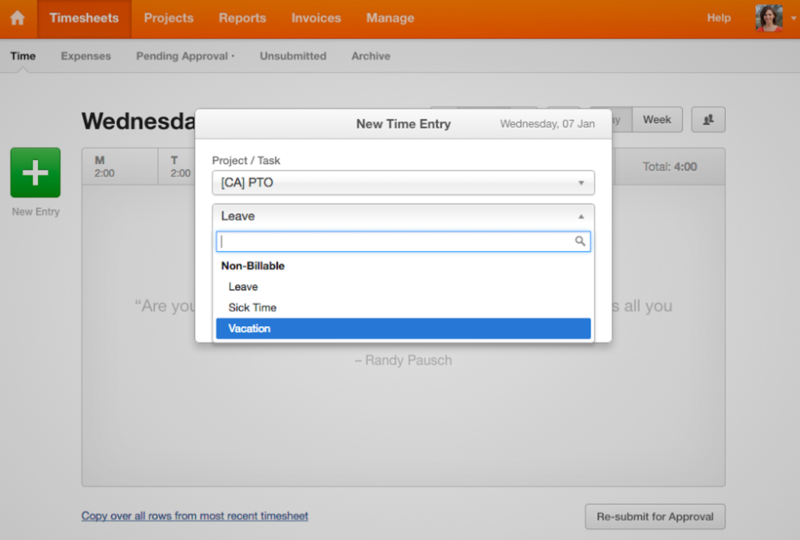 It will automatically round in the reports, but you'll see actuals in your timesheet. If you use a time tracker, you do not need to round your hours up to 15 min intervals bc the report that gets run rounds it up for you. Although no harm if you do it manually still. You must enter your time each day before you sign off for the day. Ideally time is tracked in real time, but must be entered by end of day. Fixed price projects: If someone only worked 4 hours then that is what she should bill. If she works an 8 hour day, even if 2 hours were for civicactions related meetings or comms, she should bill it all to the fixed price project. She doesn't need to make up the 2 hours from today if she can get her tickets complete, but if she's going to fall behind then she should do her best to catch up. A lot of our internal time represents an investment in a service area, so we're going to track that time accordingly. Log your time in the CivicActions project: CA > Onboarding > select your service area or "Company-wide" for areas like Sales > then enter a description like the below examples in the task description that includes the word onboarding. For some internal projects, we don't care about tracking our time by service area, and you won't see service area based tasks there. 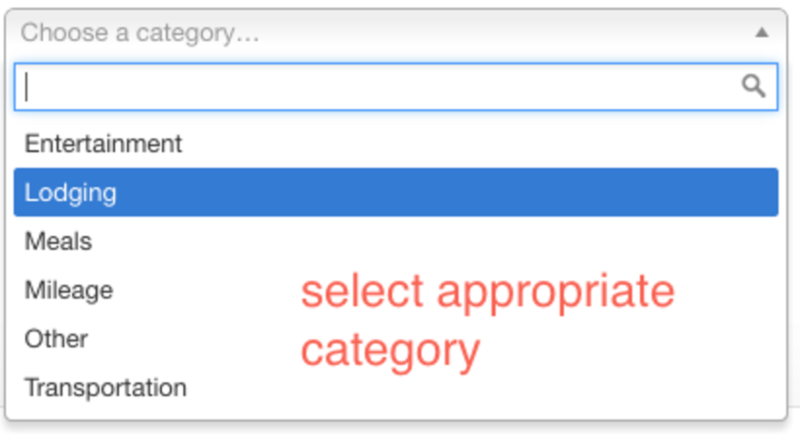 The Harvest plugin in Jira is located along the right column of a ticket. Currently it does NOT update your time in the "Jira Time Tracking" section, but only logs time in Harvest from Jira. 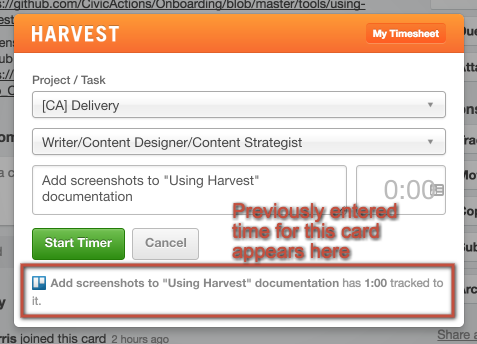 You must add time to BOTH Harvest plugin & update the Time Tracking section in Jira. 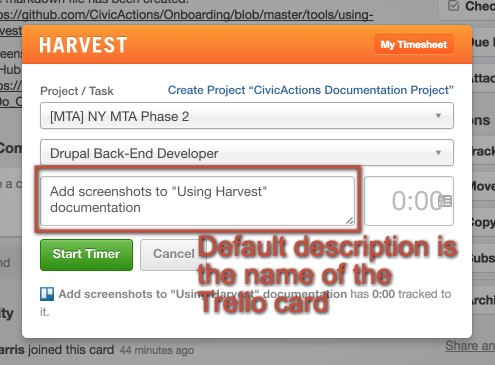 The Trello integration will require that you install the Chrome extension found here: https://www.getharvest.com/trello You can then log time directly from Chrome, as well as Trello cards. 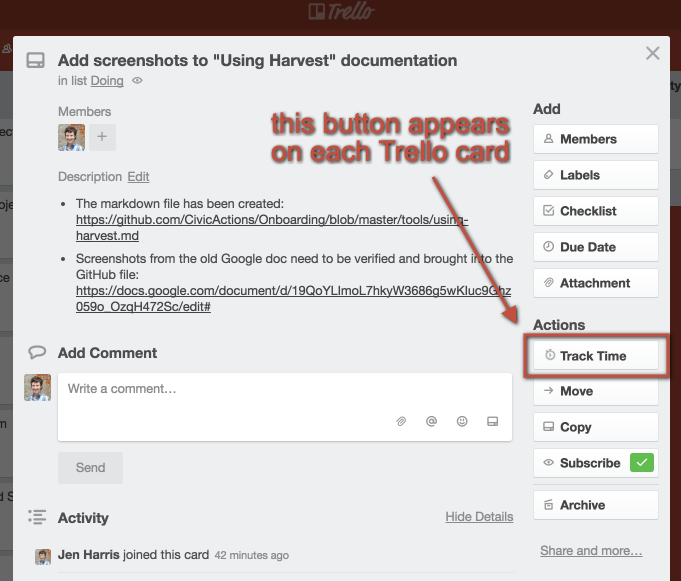 You may need to refresh or log out/into Trello to see the "Track Time" action. Track expenses in the Harvest Expense tracking section. Before you incur or track expenses be sure to get approval as described in the expense policy. Billable expenses are when a cost can be passed back through to the client. This is usually only the case when the client has an approved budget for travel or other costs. Your project manager will be able to answer questions per project if you are not sure about the cost being billable or not. Here is a quick overview of the expenses feature in Harvest. We track vacation, leave and sick time and leave for employees in Harvest. There is oversight on this, but ultimately you are responsible for this accuracy. Timeoff will not negatively impact your billable hour percentage. If you are often "on-the-go" consider downloading the Harvest App. This is also great for (and almost required) for any onsite trips & conferences. It makes entering time easy, but also makes entering your expenses a snap. You can take a photo of your receipt right from the Harvest App - no more worries about losing that receipt or having to enter them all after your trip. It will also provide visibility on the total expense costs while traveling.